A normal fishing day runs from 6:30 AM until 5:00 PM. 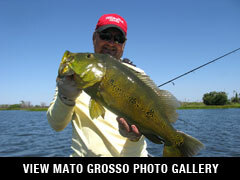 Anglers are paired two to a boat with an experienced Brazilian guide. Usually, you will be fishing from narrow-hulled 18-foot V-hull aluminum skiff with a short-footed 15 to 40 h.p. outboard. These boats can cruise over shallow sandbars and flats and get you into places other boats cannot reach. The most exciting aspect of peacock bass fishing is its propensity for annihilating large topwater plugs or flies. When topwater activity slows, switch to a jerk bait or Jungle jig or you may downsize the large topwater baits to more traditional sized baits like we use in Florida. Visa fees, international airfare and airport departure taxes, fishing tackle, tips, gifts or items of a personal nature. You'll depart from Miami on your international flight to Manaus, Brazil. On arrival, you be transferred to the Hotel. The next morning you will transfer to the domestic airport and be transported by plane and/or express boat to camp. 8 anglers per week or 12 anglers per week, depending on your chosen camp size. Two anglers share roomy safari-style floating cabins. These units are actually 12' X 15' cabins on pontoon style floats, which can be easily towed to new fishing areas, and securely beached in scenic jungle settings. Each floating cabin offers two comfortable beds, air-conditioning unit, fluorescent overhead lighting, chairs and tables. Each unit has its own bathroom facility, with sink, toilet and shower. Each camp typically accommodates 8 or 12 anglers. There is no need to overpack, as laundry service is available. Day 1: Depart Miami in early morning (Tam) or late afternoon (American Airlines or Copa Airlines). Arrive into Manaus. Transfer to Hotel. Overnight. Day 2: Fly to fishing area. Orientation. 1/2 day fishing time permitting. Overnight at camp. Days 3-8: Full fishing days. Overnight at camp. Day 9: Return to Manaus by flight and connect with your departure flight to Miami. A valid passport with at least six months validity is required for U.S. citizens, as well as a valid Brazilian tourist visa. Passengers assume all responsibility for obtaining valid passports and visas. Visa application forms are available with Brazilian consulate. The official language in Brazil is Portuguese. The camp host speaks English. Some of the guides have a very basic working knowledge of English with respect to fishing. Many Spanish words are similar enough to Portuguese that rudimentary communication in Spanish may be possible. Learning a few key words in the host country's language may prove beneficial and your efforts to communicate will be appreciated. Two anglers per cabin. Each cabin offers two comfortable beds, air-conditioning and overhead lighting. 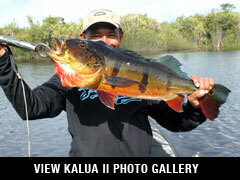 The Kalua II typically accommodates 8 anglers. There is no need to overpack, as laundry service is available. Day 2: Fly to fishing area. Orientation. 1/2 day fishing, time permitting. Overnight on Kalua II. 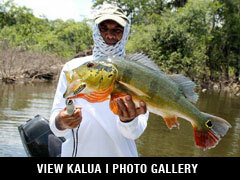 Anglers fish two to three per boat with experienced guides. 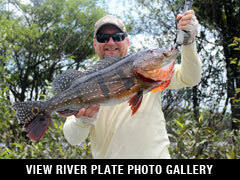 Target species are large catfish, peacock bass, corvena (freshwater drum), bicuda, payara and giant wolfish. $4590 per person (double occupancy) plus international airfare to Sinop, Brazil. Roundtrip flight: Sinop to village. International airfare to Sinop, Brazil, gratuities to guides and village staff, international departure tax, meals while in Brasilia, fees associated with obtaining passport and visa. Anglers fly to Sinop and either stay in a hotel or time permitting fly directly out to the indian village, overnight. Anglers actually stay in the native village of about 100 inhabitants. Cots or an air mattress in small tent will be provided for the anglers. Note: It can actually get very cool at night (50's) so bring some heavier clothing to sleep in. Meals are simple but delicious and natural. They mostly consist of rice, beans, eggs, fish, chicken and fruit. Sodas and water are plentiful but there is no alcohol allowed in the village. Day 1: USA - Sinop. Overnight hotel or go directly to camp. Day 2-7: Full fishing days. Overnight village. A valid passport with at least six months validity is required for U.S. citizens, as well as a valid Brazilian tourist visa. Passengers assume all responsibility for obtaining valid passports and visas. Visa application forms are available at the Brazilian consulate. The official language in Brazil is Portuguese. Many Spanish words are similar enough to Portuguese that rudimentary communication in Spanish may be possible. Learning a few key words in the host country's language will prove beneficial and your efforts to communicate will be appreciated. Daytime temperatures typically range from 80-100 degrees during the day, but typically cool down to the 60's or even the 50's in the evening. Heavy tropical downpours can occur even during the "dry season" so be sure to pack a light rainsuit. Humidity in the tropics can play havoc with cameras or other electronic devices. We recommend you purchase trip cancellation insurance to cover any losses should you have to cancel to due to unforeseen illness or other emergency. Certain restrictions do apply. Premium rates are typically starting at about $70 per $1,000 of coverage, and usually include some benefits for lost baggage, trip interruption, and emergency evacuation.